For as hard as you have worked to accumulate assets, you have a right to enjoy them during your lifetime and ensure they are distributed according to your wishes, with minimal tax impact, and maximum wealth preservation and ease of execution. The experts at HL have guided generations of clients through the estate and trust planning process. We recognize that each individual and family is unique. By keeping abreast of the ever-changing tax laws and knowing your objectives, we can structure the best possible plan given your circumstances. This entails working closely with your other professional advisors. In addition to estate planning, HL advises clients on trusts, gifting strategies and philanthropic and charitable planning. Clients can also rely on HL’s expertise in developing succession plans to transition companies to the next generation of owners with minimum disruption and loss of assets. Also, for many years, the Public Administrators in several counties of NY State have entrusted HL with their estate administration engagements. 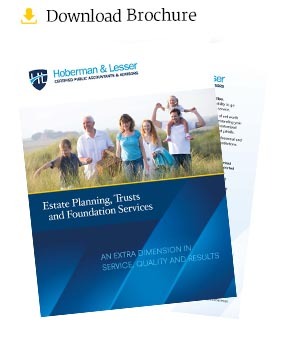 To begin the planning process or to arrange for a review your existing estate plan, contact Robert Hoberman at 212-463-0900 or e-mail robert@hobermanlesser.com.